GT Advanced Technologies opens new crystal growth facility to meet imminent silicon carbide market boom, reports Rebecca Pool. In June this year, US-based GT Advanced Technologies, opened a state-of-the-art silicon carbide manufacturing plant in Hudson, New Hampshire. Equipment, including crystal furnaces, has been shipped over from the company's former Merrimack facility, sold in December 2016. And as GTAT chief executive, Greg Knight, puts it: "Merrimack was designed for a very different business so we're now at Hudson, which has been designed from the ground up for this business." "The facility is designed to be north of 100,000 square feet of crystal growth production," he adds. "The first batch of furnaces are already installed and are producing crystal. In the past we have installed thousands and thousands of furnaces so this is very much a known entity for us and we intend to ramp production very quickly." GTAT has been producing crystal-growth equipment for the photovoltaics industry, as well as honing SiC boule production, for several years. Emerging from bankruptcy following a disastrous sapphire furnace supply contract with Apple in 2014, the company set out to establish a stable, high yield robust six inch process for SiC boules for photovoltaic, electric vehicle, data centre markets and more. The current process includes the company's 'SiClone' SiC sublimation furnace and full silicon carbide seeds, and Knight is confident the resulting six inch boules compete with four-inch versions on quality. What's more, the chief executive is certain his company and process is ready for a SiC device market that is poised to explode. "We believe that the demand for silicon carbide will truly start to accelerate around 2021 to 2022, so in my mind, now is the time to enter the market," he says. "The market is still far from this inflexion point, when you see volumes ramping, but we are entering at scale and will add incrementally as utilisation rises." "We can respond very quickly to utilisation, which is important as you don't want to outpace your self and end up with a factory that's say, 30% utilised," he adds. "But we will be able to be a major player as the market gets through the inflexion point and and reaches true volumes." GTAT's new facility, located in Hudson, New Hampshire, US also includes the company's new corporate headquarters, and research and development centre. Crucially, Knight hopes to soon establish a robust supply chain for silicon carbide markets, providing low cost, highly repeatable crystal growth equipment that can be easily scaled with a 'fairly low' capital outlay. He is confident that GTAT's experience in crystal growth processes and furnace production, combined with managing supply chains, gives it a competitive edge in meeting the growing demand for wide bandgap semiconductors. At the same time, however, Knight also wants to ensure GTAT doesn't compete with its customers. As he puts it: "One of the largest problems in the silicon carbide industry today is that the substrate providers are also the main competitors to their customers.... and we don't think this is a long-term strategy that is particularly healthy for the industry." Given this, GTAT will grow the silicon carbide crystal and then sell it to vertically integrated customers that can fabricate wafers and devices. "We're also aligning with strategic partners, which include the pure play wafer manufacturers that will also take our crystal and fabricate epi-ready wafers that can be distributed into the market," he adds. 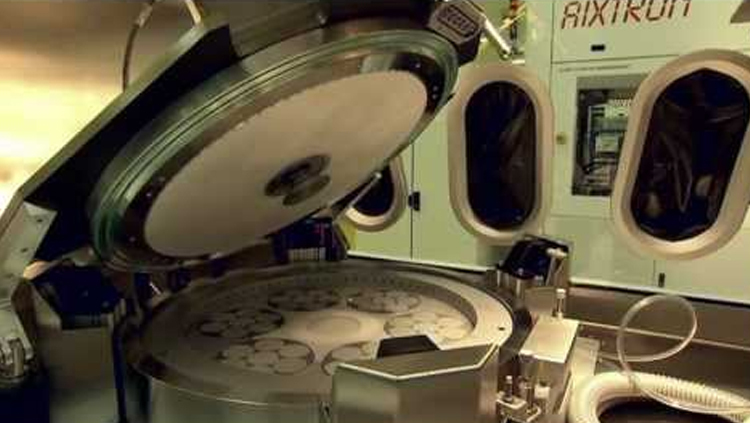 Right now, GTAT manufactures six inch silicon carbide materials, but as Knight points out, the company is ready to transition to eight inch production when volumes demand the larger wafer size. Importantly, the chief executive reckons the new facility is ready and can make this leap without any additional capital outlay. "Fabs in Asia, including China, are focused on four inch wafer sizes while European and US fabs are working with six inch wafers, and are looking towards eight inch sizes," says Knight. "Such high-end fabs are running on eight inch silicon and larger, and are currently using their equipment on a downsized six inch process, so moving to eight inch wafer sizes will not require new capital for most of the Western fabs." Importantly, as part of its roadmap, GTAT will also focus on reducing costs. Right now, the selling price of a six inch SiC wafer comes in at between $1200 and $1500, but Knight reckons these figures will drop to $1000 in the near future. "Our costs can bring [today's] selling price down significantly and we believe that in a few years we will have the crystal component cost of a wafer - not including additional process steps - to below $300," he says. "We really have to get the epi-ready wafer costs down to a point where you can get mass adoption into the end markets."